I've been in somewhat of a knitting frenzy for the last several days. There's something about the cold, wind, rain, and general dreariness that has enveloped this eastern side of the US that makes me want to plant myself in a chair with a cup of hot tea and knitting and not move for the entire day! And so that's mostly what I've done. Four knits in as many days. This first knit is to be Finn's Christmas stocking hat, although I admit it's an act of will not to just give it to him now. 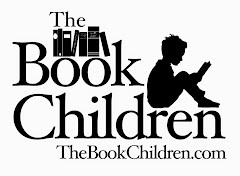 One of his favorite autumn books is Elsa Beskow's story of Woody, Hazel, and Little Pip. 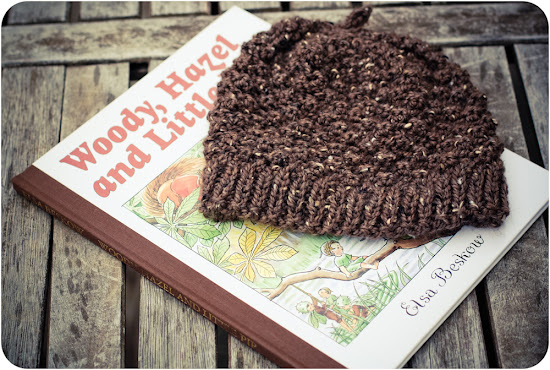 (You can see the Woody and Little Pip project we did with last year in this post.) Once I saw the Little Pip Acorn hat on Ravelry, I knew it would be Finn's Christmas hat this year. The hat is knit in Knit Picks City Tweed in Tabby, which I think lends the perfect amount of nubbiness and texture to accentuate the acorn cap ribs. The other knitting I've been working on is a bit tinier. Paulie and Philip are expecting a baby sister in December. 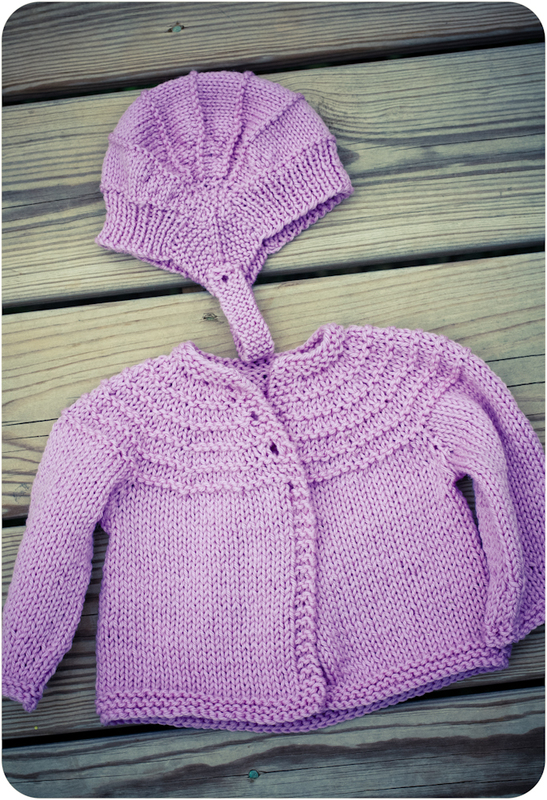 When they first found out, back in the summer, the first thing Paulie asked me was if I would knit something for the baby. Well, of course! Both boys were thrilled to come back from their mom's house on Monday to discover that I'd made several baby things over the weekend. 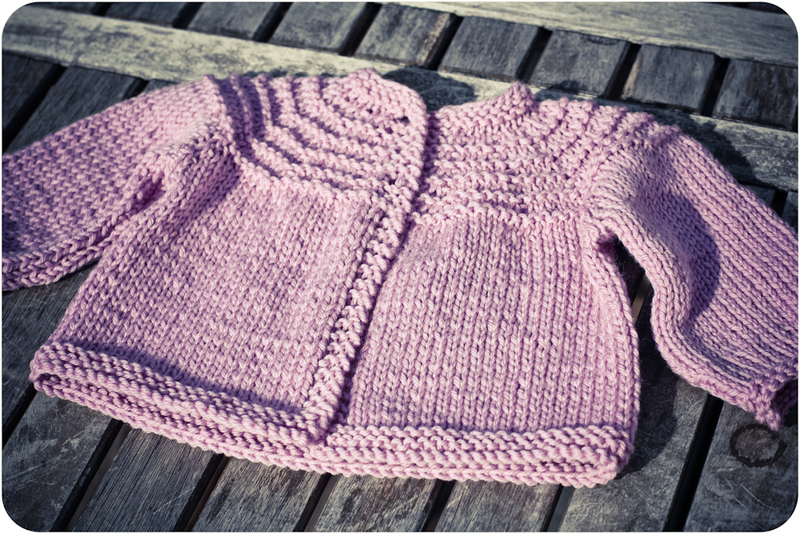 This 5 hour baby sweater I first saw over at Hullabaloo Homestead and thought it would be perfect. It really is a super sweet sweater, although it took me closer to 8 hours to knit, I think. I used Knit Picks Swish DK in Sugar Plum, which really looks closer to lavender than it does in my photos. I wanted a yarn that would be soft and easy to care for. 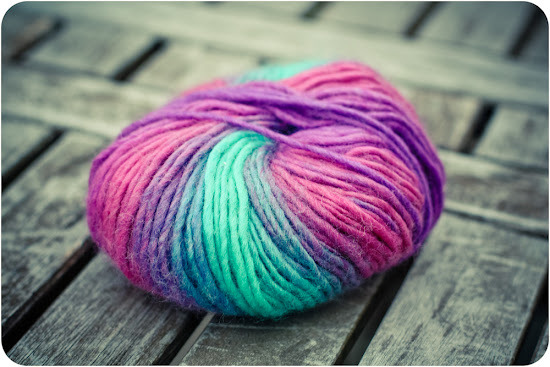 This yarn definitely fits the bill! With the leftover skein, I thought I would make a little hat and booties, but I settled on this aviator-style hat, which used most of my skein. It's completely adorable and, with the little chin strap, will stay on well. I thought the garter stitch lines in both pieces matched nicely. Unfortunately, both of these knits are still waiting for buttons. 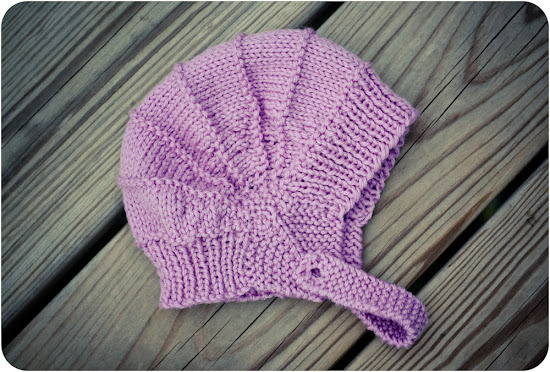 The first hat I made for the baby is a decidedly newborn hat, although I didn't use a pattern or even write down what I did. 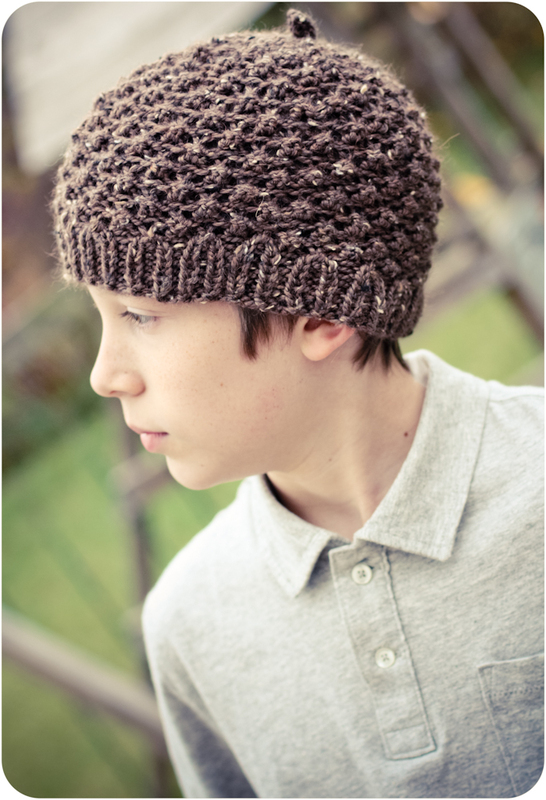 It turned out perfectly newborn size with a cozy waffle weave. And I was able to use some scrap cotton yarn to boot! All this leads me down to the fact that I have no new projects to show you. 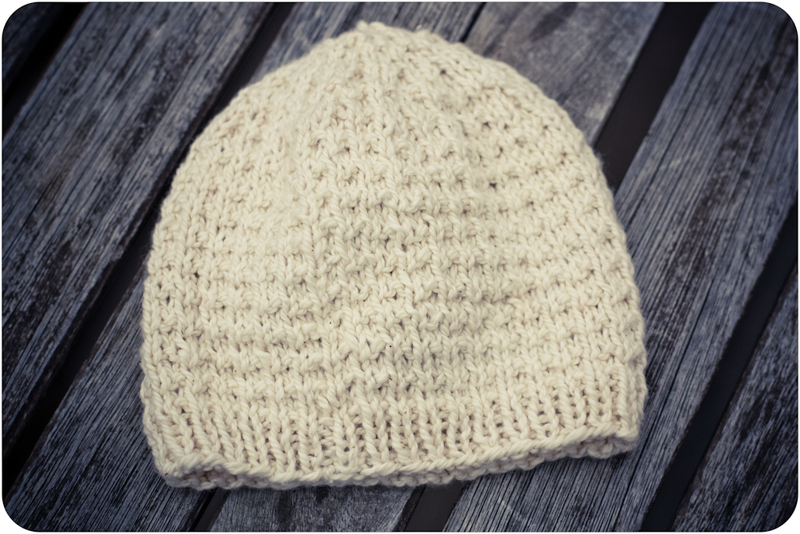 I finished up the last hat just yesterday evening so I haven't started anything new yet. (And I'm still ignoring the 2 unfinished projects upstairs, ahem.) Since I didn't have enough of the sweater and hat yarn to make booties, I though I might use this leftover bit that I found it my stash. It was a sweater for Elizabeth last year. I just can't decide if the striping will help or hinder in the bootie departement. All your projects look so nice Joy and how fun to be baby knitting. I have a friend that is expecting her first grandchild and I promised to knit for her, I just need to decide what! What beautiful knits!! 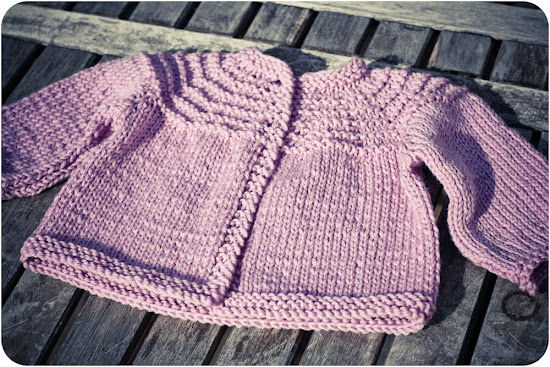 I've made the five hour baby sweater for all the babies in my life since I found the pattern a few years ago. I love it! You've been busy! All of it is beautiful. Great projects! 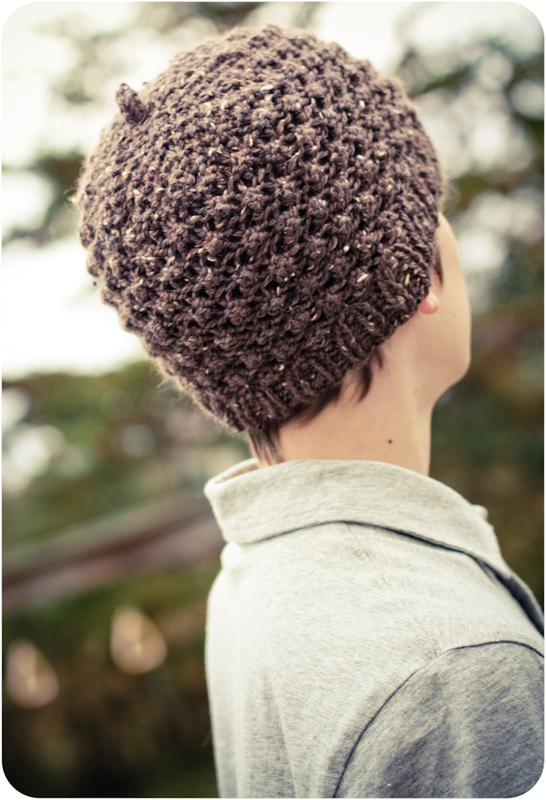 The acorn hat is beautiful! Love the hat!!!!! And the sweater set, oh you have been a busy little knitter haven't you? What a cute hat and baby things! So many beautiful knitted items! What a busy four days. It is good weather for that in the east. Here in AZ it is still warm. Love all those baby things and the acorn hat - perfection. Oh sweet! I love the acorn hat. The baby sweater and the aviator hat are also adorable.